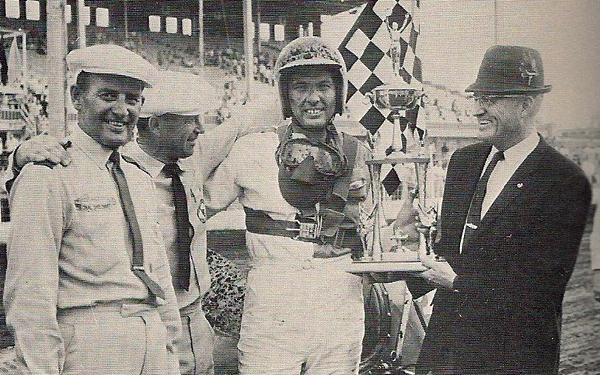 Jerry Blundy accepts the trophy from Iowa State Fair secretary Kenneth Fulk as Gene Van Winkle (far left) and Woody Brinkman (near left) look on. 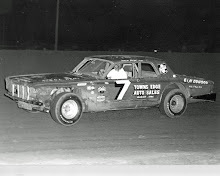 Des Moines, Iowa (August 22, 1963) – The second session of big car racing at the Iowa State Fair was still on a slick track – dry in comparison to the first Sunday’s wet conditions – but drivers got down to serious business and Jerry Blundy emerged as best for the day. The Galesburg, Ill., ace won the 25-lap feature on Thursday afternoon, after having set fast time during qualifying. 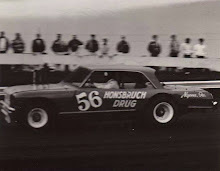 He also finished second in a heat race and fourth in the trophy dash. Blundy led the entire race; however, he was closely chased by Buzz Barton. Barton was able to close the gap on two spin outs, which brought out the yellow flag. 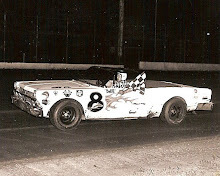 But Blundy’s Chevrolet-powered creation was running hot and he maintained the lead for the $700 first prize. IMCA’s championship contenders did little to better their cause. Gordon Woolley, from Waco, Tex., cracked into the wall during time trials and wrecked his Weinberger Chevrolet. It was available for the feature but the smashup apparently caused it to lose some of its pep and he retired during the late stages of the race. 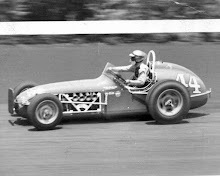 Pete Folse of Tampa, Fla., the current point leader, finished ninth and offered little enthusiasm for a better position. 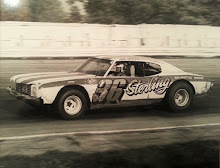 Jud Larson, a former Indy 500 chauffer, stepped back into IMCA on a comeback journey following a heart condition and performed admirably in Speedy Helm’s Chevy. He won his heat and finished sixth in the feature. 1. Jerry Blundy, Galesburg, Ill.
2. Buzz Barton, Tampa, Fla.
5. Harold Leep, Wichita, Kan.
7. Don Brown, San Fernando, Calif.
8. Harry Ross, Campbell, Calif.
9. Pete Folse, Tampa, Fla.
11. Duane Stoneking, Oquawka, Ill.
12. Jim Moughan, Springfield, Ill.